This is the sixth entry in a monthly series we’ll be running throughout 2017 looking back at historically significant profile moments in our state’s history. 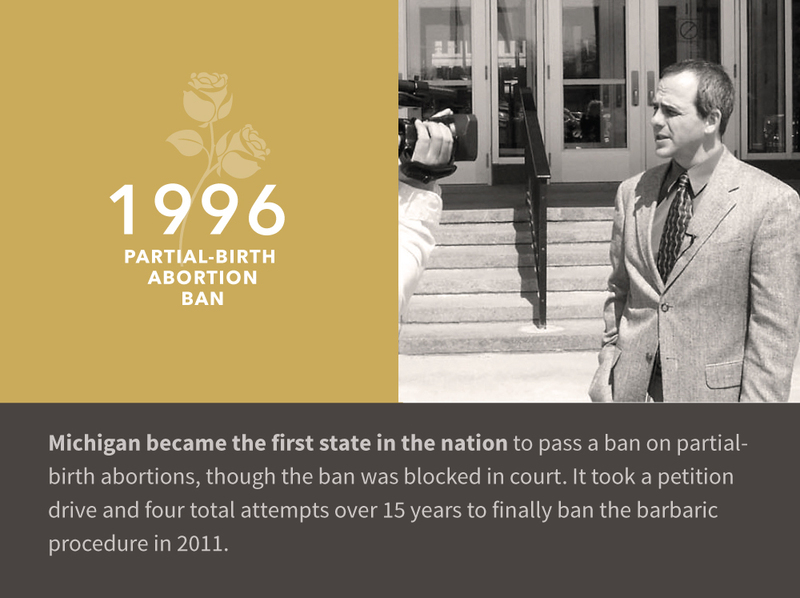 Michigan's Partial-Birth Abortion Ban Act of 2011 had a long road to eventual victory. 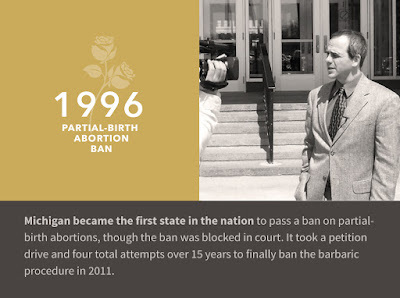 Along the way however, the ban illustrated the tenacity of the prolife movement. "While maintaining this tension, lifting the cervix and applying traction to the shoulders with the fingers of the left hand, the surgeon takes a pair of blunt curved Metzenbaum scissors in the right hand. He carefully advances the tip, curved down, along the spine and under his middle finger until he feels it contact the base of the skull under the tip of his middle finger. Reassessing proper placement of the closed scissors tip and safe elevation of the cervix, the surgeon then forces the scissors into the base of the skull or into the foramen magnum. Having safely entered the skull, he spreads the scissors to enlarge the opening. The surgeon removes the scissors and introduces a suction catheter into this hole and evacuates the skull contents. With the catheter still in place, he applies traction to the fetus, removing it completely from the patient." The most curious feature of the long debate over partial-birth abortion is the visceral anger of abortion supporters when the procedure is plainly described as a partial-birth abortion. They often say it's a "made-up term." Abortion supporters frequently refer to the equally barbaric suction abortion method as merely "gentle suction" of a "clump of cells." There are not enough euphemisms to hide the brutality of a partial-birth abortion: the child is partially born, her head is stabbed with blunt scissors, and her brains are sucked out. It's essentially infanticide. The prolife movement got their hands on Haskell's paper in 1993, and quickly went to work publicizing it. Congress moved to ban the procedure in 1995. The U.S. House acted first with an overwhelming vote of 288-139, and the Senate followed suit with a vote of 54-44. Sadly, President Bill Clinton was completely devoted to abortion, and vetoed the bill on April 10, 1996. The U.S. House had the two-thirds bipartisan vote necessary to override Clinton's veto, but the U.S. Senate came up short. Following failure at the national level, Michigan prolifers moved quickly. State Rep. James Ryan introduced a ban using the same language as the federal bill on May 21, 1996. On June 6, the Michigan House voted 63-36 and the Senate voted 28-8 for the ban. Governor John Engler signed it into law on June 14, 1996. 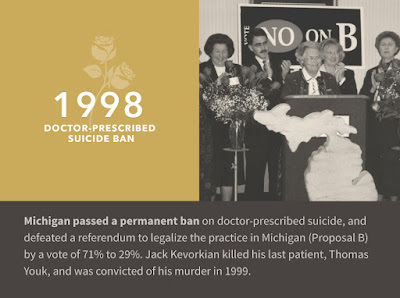 Michigan led the way as the first state in the nation to ban the procedure. The ban was challenged in federal court, however, and lost. Congress made another attempt to ban the procedure in 1997, but once again Bill Clinton vetoed the bill. Michigan went back to the drawing board, this time using a unique approach. Michigan passed the Infant Protection Act in 1999, declaring that a partially-born child has legal protection as a person. A federal judge blocked the law, following the U.S. Supreme Court decision in Stenberg v. Carhart in 2000, which struck down Nebraska's partial-birth abortion ban. Michigan's new attorney general, Jennifer Granholm, refused to appeal the case. Prolifers were undaunted. On the federal level, with the election of President George W. Bush, a new effort to ban the procedure was successful. President Bush signed the Partial Birth Abortion Ban Act into law on November 5, 2003. The law was quickly taken to court. Meanwhile, Right to Life of Michigan made a third attempt to ban the procedure in 2003, once again using a novel approach. Our Legal Birth Definition Act declared birth to be at the point where any portion of the child is vaginally delivered outside the mother's body. The bill passed the Michigan Legislature, but was vetoed by Jennifer Granholm, now advocating for abortion from the governor's mansion. Prolifers persevered. 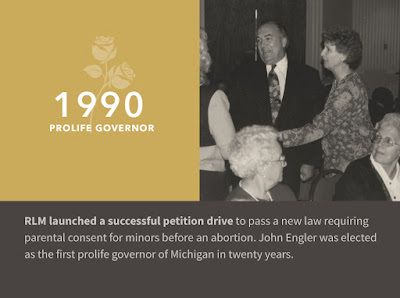 Using Michigan's unique constitutional procedure for citizen-initiated legislation, Right to Life of Michigan kicked off "The People's Override," cutting Granholm out of the process to enact the Legal Birth Definition Act. An army of RLM volunteers collected 460,034 signatures in just three months, almost double the signatures required and setting state records for the most signatures collected with all-volunteer circulators and the highest signature validity. The ban was initiated into the Michigan Legislature, the House and Senate passed it again, and the bill became law in 2004 without Granholm. Once again, a federal judge overruled the law, and an appeal to the U.S. Sixth Circuit Court failed in June 2007. There was cause to celebrate, however, despite the setback in court. In April 2007, the U.S. Supreme Court upheld the federal partial-birth abortion ban by a 5-4 vote in Gonzales v. Carhart. Partial-birth abortion was finally illegal in the United States. It was the first time the Supreme Court upheld a ban on an abortion procedure, which was an important step. We were not content with the victory, however. Federal laws require federal enforcement, and a pro-abortion president with pro-abortion prosecutors and officials would likely ignore the law or refuse to enforce it. Personnel is policy, especially on the issue of abortion. The 2010 gubernatorial election finally put the last puzzle piece in place. With Granholm gone, newly elected Governor Rick Snyder signaled his openness to banning partial-birth abortion, and on October 11, 2011, he signed Michigan's Partial-Birth Abortion Ban Act into law. What were the end results of this lengthy process? Public opinion on abortion underwent a big reversal. For the first time many Americans saw on TV or read in a newspaper just how brutal abortion is, and that late-term abortions are not an urban myth. A majority were shocked such brutality was perfectly legal. It's unlikely abortionist Martin Haskell knew his paper at an obscure abortion convention could change the face of the abortion debate against him. The Supreme Court's 2007 decision in Gonzales v. Carhart was important. It marks the first time the Supreme Court upheld an abortion ban, creating a large crack in Roe v. Wade's foundation. It has set the stage for additional efforts to challenge equally barbaric dismemberment abortions. It also proved to the wider world that prolifers are not going to surrender. There was speculation at the time that the U.S. Supreme Court's 1992 decision upholding legalized abortion in Planned Parenthood v. Casey might spell the end of efforts to protect unborn children. The decision itself "calls the contending sides of a national controversy to end their national division by accepting a common mandate rooted in the Constitution." Instead we've seen a revitalization of prolife efforts and advances, especially on the state level. Visit our blog in December for our final post honoring 50 years of prolife advocacy, our effort in 1998 to defeat Dr. Death. The Centers for Disease Control released their 2014 national abortion report. A total of 652,639 abortions were reported to the CDC in 2014, a decrease of 11,896 from 2013. The CDC numbers are incomplete because some states hide their abortion numbers. The 2014 report doesn't include California, Maryland, and New Hampshire. The Guttmacher Institute, a pro-abortion research institution that tracks abortion numbers independently, estimated 157,350 abortions in California in 2014. The report shows a smaller percentage of women are having abortions, and a larger percentage of women are choosing life for their children. Of the states that reported their numbers consistently from 2005 to 2014, the 2014 abortion rate was 12.1 per 1,000 women aged 15 to 44 years, decreasing 2% in 2014. The abortion ratio in those states was 186 per 1,000 live births, a decrease of 7% in 2014. The abortion ratio for women ages 15-19 declined from 393 abortions per 1,000 live births in 2005 to 338 abortions in 2014. This means a higher percentage of pregnant teens are choosing life. An encouraging trend is that minority abortions continue to decrease, but minorities continue to have a large proportion of abortions. From 2007 to 2014, the abortion rate for non-Hispanic Black women decreased 27%, and for Hispanic women it decreased 41%. Non-Hispanic Whites comprise 77% of the U.S. population, but only have 38% of abortions (in the states that consistently report abortion date by race). Non-Hispanic Blacks comprise 13% of the population, but have 36% of abortions. Hispanics are 18 of the population, and had 18 percent of abortions. The Guttmacher Institute found similar numbers in 2014: Whites had 39% of abortions, Blacks 28%, and Hispanics 25%. Relatively little attention is paid to this ongoing racial disparity in the media, despite the easy access to numbers proving its existence. The abortion industry continues their relentless focus on minority women as a major source of their income. Even though abortion rates and ratios are declining in every age group, the age of women having abortions is increasing with the rapidly aging demographics in the United States. In 2005, women 30 and over had 26.5% of abortions. In 2014, women 30 and over had 30.4%. Abortion advocates often dismiss late term abortions as just a tiny percent of abortions overall, and therefore they should be completely ignored. The CDC reported only 1.3% of abortions in 2014 were at 20 weeks gestation or later, but that translates to about 12,000 annual late-term abortions. The CDC reported 11,008 gun homicides in the U.S. in 2014. Are late-term abortions getting as much attention in society as gun violence? What about abortions overall, considering there are about 84 abortions for every gun homicide? Nearly half of women who have abortions have already had at least one abortion. The CDC reported repeat abortion rate was 44.9%: 24.7% of women were having their second abortion, 11.6% were having their third, and 8.6% were having their fourth abortion or more. Double your life-saving gifts online! The Right to Life of Michigan Educational Fund is a powerful tool for saving lives. Prolifers start at a natural disadvantage on the abortion issue, since we can't really see the unborn child in the womb with our own eyes. How do you fight an injustice committed against unseen victims who can't speak for themselves? You can help us be there voice and find other avenues to open the eyes of people to the issue of abortion and the unborn child. From now until the end of the 2017 your online donations to the Right to Life of Michigan Educational Fund will be matched. Generous support allows us to offer you this opportunity to make your gifts count double. Donations to our Educational Fund are tax-deductible. Our goal again this year is $50,000. Will you help us reach it? Will you help us share positive prolife stories online, through social media, and through the television? Will you help us equip prolife grassroot volunteers around the state with the resources to change hearts and minds in their local communities? Will you enable us to be a resource available 24/7 to help women facing crisis pregnancies find the resources they need? Please help us defend the unborn with your generous life-saving gift today. At Right to Life of Michigan we've been flooded with a rash of calls and requests lately of a most disturbing nature. Patients and their families are finding themselves subject to Kafka-esque actions designed to take aware their autonomy and wishes—with deadly effect. Jack Lessenberry, Michigan Radio’s senior political analyst, has written an article claiming legislation we're working on to fix these issues are some sort of fundamentalist religious plot to force patients to stay hooked up to machines forever. He wistfully recalls the days of Dr. Death, Jack Kevorkian, killing patients across Michigan. House Bills 5075 and 5076 and SB 597, are being sponsored and pushed by the religious right, primarily Right to Life of Michigan. They are billed as being written to stop abuses, to stop hospitals and doctors from forcing people to die without their consent. But that’s not what’s really happening. 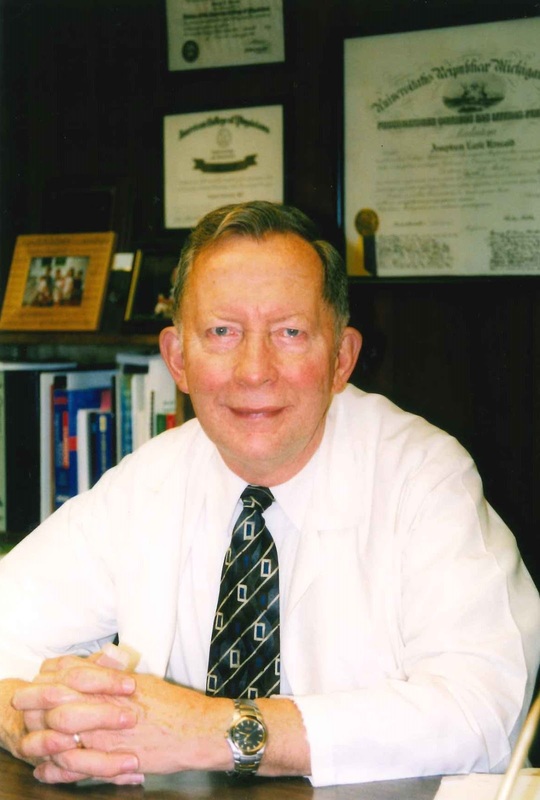 As Dr. Byrnes put it, "Such a bill would allow for a family member – even a family member who had no real concern for their relative’s wishes or well-being – to keep the patient alive for an indefinite period of time." What is the real purpose of these bills? They address two distinct problems. First is the practice of secret do-not-resuscitate orders being placed in patient's files. Secret DNR orders are just plainly wrong, and it's wrong for Lessenberry to frame his piece around patient autonomy when he seeks to defend the practice of patients being deceived about the care they expect. The second problem is equally troubling. We've learned that some hospitals are going behind the backs of patients' families and legal patient advocates to obtain secret court orders to establish guardianship over patients. Family members are showing up at the hospital only to discover hospital staff have taken control over their loved one to end their life. That is an indefensible abuse of our court system. Secret court proceedings resulting in life or death decisions belong in Soviet Russia, not an America with robust constitutional protections. Patients have a right to have someone defend their life. The bills would require hospitals to notify family members that they intend to go to court. In addition, the bills would require the doctor or medical facility to prove by clear and convincing evidence that the patient advocate or family is not acting in the best interest of the family before a guardian can be appointed. They also create a standard that assumes it is in the patient's best interest to be alive, and the hospital has to prove otherwise before taking control of the patient. There is a creeping assumption in our society that the sick and disabled are better off dead, and some courts are making that the controlling presumption. The default presumption should be that a special case should be required for hospitals to take over a patient's autonomy to end their life. There really are situations where a patient's family is being unreasonable or a patient advocate is violating the patient's wishes, and hospitals have a duty in those cases to represent the patient's interest in court. Those situations must be handled in the light of day in a fair court process, however, not railroaded through a star chamber court in the dark. True, there may be some possibility of abuse today. But he said, "Medical cases in these situations are immensely complicated and can’t be addressed by the simplistic wording" in these bills. He told me they would “stop doctors and hospitals and clinical ethicists like myself from being able to stop treatment." How could you trivialize abuses like secret court proceedings and secret DNR orders? These are not trivial issues, nor are they complicated. The purpose of a guardianship hearing is to sort out care conflicts, not to rubber-stamp cost-cutting measures that sacrifice patients' lives. One of our own staff members directly experienced this, when her conscious father who was asking to be treated discovered the hospital had given up on him and placed a DNR order in his file without his request. What about Bob's wishes and autonomy? Are death wishes the only ones that count? You can pick whatever treatment you like as long as it's no treatment at all? The purpose of these bills is not to let family members keep patients alive indefinitely, as Mr. Lessenberry falsely claims here. Patients do have a right to refuse unwanted medical treatment, and that right should be equally as important as patients who want medical treatment. The purpose of these bills is to prevent hospitals from deception and unjust violations of due process designed to end a patient's life against their will. Lessenberry writes, "Many of us want some element of control over our final destiny..." That's precisely our point! As we've begun working on these bills and publicizing these cases, we've discovered a vast undercurrent. Many believe hospitals will abuse their power to mistreat patients in service of cost cutting concerns. Many of these cases and examples are egregious and have never been publicized. For whatever reason many people don't believe anyone will speak up for them on this issue, and that there's nothing they can do about it. That's about to change. We'll see how the broader hospital establishment confronts these proposed change in the law, and if any changes are needed in the legislation as it moves forward, but we ask Mr. Lessenberry and Dr. Byrnes this: are secret DNR orders and secret court orders really the hill you want to die on? What sort of message will that send to an already cynical public? Great news out of Lowell, just a few miles outside Grand Rapids! They were able to save a life using the abortion pill reversal process. It's one of the first in Michigan, if not the first. It isn't every day that life comes full circle. It also isn't every day that you are able to save a life. Recently Alpha Family Center in Lowell was able to experience both when a luncheon speech they heard more than a year ago proved to be the difference between life and death for one of their clients. Quarterly Grand Rapids Right to Life hosts their Support Services Luncheon. The many prolife pregnancy help organizations in Grand Rapids come together at the luncheon to discuss different projects they are working on. The guest speaker at one of the 2016 luncheons was Dr. Kim Barrow, who talked about a process to reverse RU-486 abortions (also known as the abortion pill or mifepristone). Abortion pill reversal was a relatively new idea and many pregnancy centers were not aware of it. Christa Wetzel, executive director of Alpha Family Center in Lowell, said, "After hearing about this, we knew this was something that they needed to know more about. This was a really monumental moment for us that God created. I truly believe he created this reversal so that we could help these women." The success rate of abortion pill reversals is currently 55 percent according to abortionpillreversal.com, but a new study in the process of publishing has found the life-saving results may be as high as 60 to 70 percent of children. Unfortunately the success rate is not 100 percent, making for some tense moments. Mandy referred Allison back to Alpha Family Center in Lowell for an ultrasound the following Wednesday. Everyone knew heading into the ultrasound room that there was a significant chance that Allison's baby wasn't going to make it, despite their best efforts. In the beginning of the ultrasound appointment, there was no movement from the baby. After several long, tense, anxious moments, some movement finally appeared on the screen. Allison's baby decided to wave at everyone. This is a rare feat since the baby was just 10 weeks along. What happens when Roe v. Wade is overturned? Every judicial nomination in America revolves around this important question: would this justice vote to overturn Roe v. Wade? Unfortunately many supporters of legalized abortion are invested in spreading fear to the public about what would happen if Roe v. Wade were overturned. It's important for the public to understand the reality of a world without Roe v. Wade, because ultimately the issue would be in their hands to again decide. Why would the U.S. Supreme Court overturn Roe v. Wade? Roe v. Wade is widely regarded as a poor legal decision. Even many legal scholars who support abortion recognize the case was not decided based on the law or the U.S. Constitution. Together with its companion case Doe v. Bolton, Roe v. Wade legalized abortion through all nine months of pregnancy in the United States, which is an extreme position that the American public generally rejects. Only five countries in the world have such an extreme abortion law (the U.S. and Canada join North Korea, China, and Vietnam). What happens the day after Roe falls? Nothing at first. The U.S. Supreme Court would recognize that abortion is not a constitutionally-protected right, and therefore the issue will be once again decided by voters and their elected officials in their respective states. Currently the states themselves have a patchwork of laws. In some states like Michigan, laws exist protecting the unborn child, and those laws will have an opportunity to be restored. On the other end of the spectrum, other states have their own state-level court decisions or constitutional provisions protecting abortion. Ultimately the states and voters are put back in the driver's seat regarding abortion policy. Any changes to the status quo of abortion-on-demand through all nine months of pregnancy depend on you. Where do you stand? What happens in the short-term after Roe falls? This depends entirely on the voters. Some states will likely ban abortion except to save the life of the mother, many will have bans featuring exceptions, and some will keep the status quo. Currently public opinion is divided on the issue, but a large majority of voters reject the status quo of abortion-on-demand throughout all nine months of pregnancy. Public opinion shows a broad consensus for banning most elective abortions, late-term abortions, tax-funded abortions, etc. What would happen in Michigan? Michigan has an important state Supreme Court precedent from 1973, shortly after Roe v. Wade was decided. Michigan law has banned abortion except to save the life of the mother since 1846. After Roe v. Wade was decided, the Michigan Supreme Court ruled in People v. Bricker that Roe v. Wade is only blocking enforcement of Michigan's law; Roe did not repeal Michigan's law. In November 1972, just a few weeks before Roe v. Wade, Michigan faced a ballot proposal to legalize abortion through 20 weeks of pregnancy. Sixty percent of voters rejected the proposal. With Roe v. Wade gone, Michigan's law would have an opportunity to go back into effect. Michigan voters and their elected officials would ultimately have the final say. What about women dying in illegal abortions? In the states that do restrict abortion, there is highly unlikely to be a significant increase in maternal deaths. Pro-abortion groups falsely inflated statistics prior to Roe v. Wade to convince voters and later the Supreme Court that thousands of women were dying because of laws protecting the lives of unborn children. Real statistics from the Centers for Disease Control verify those claims are false. In 1972, 39 women died to illegal abortions in the United States, and 24 died from legal abortions. In 1973, after Roe v. Wade was decided, 19 women died from illegal abortions, and 25 died from legal abortions. Poland is an excellent case study. Abortion had been legal under Soviet rule in Poland for more than 40 years, just like the United States. Shortly after regaining independence, Poland heavily restricted abortion. Today pregnant women in Poland are less likely to die than pregnant women in the United States. There are 21 maternal deaths per 100,000 live births in the United States, compared to only 5 in Poland. Poland is a world leader in addressing maternal mortality. According to abortion advocates, Poland's rate should be incredibly higher than the United States' rate, not incredibly better. Providing good health care to pregnant women is completely independent of abortion laws. Decades of experience in America shows that the legality of abortion affects the demand for abortion. In states that ban abortion, abortions will decline, infant adoptions will increase, and prolife pregnancy help agencies will take on an even more important role as more women seek their services. Given the difference in abortion laws between states, voters will quickly get an accurate picture of the truth when they can compare states that keep abortion legal through all nine months of pregnancy and states that don't. What are we going to do with all the babies? One of the most common arguments in discussions about the legality of abortion is that our society couldn't cope with an increased number of births. The basis of this argument is the fear that abortion is a necessary evil to maintain society's wealth. It's not clear how many states would ban some or all abortions following Roe being overturned, but births would no doubt increase. Society will continue on largely as it has before, and will likely be in a better situation. The prosperity of women and society prior to 1973 did not depend on the legality of abortion, and the same is true today. Abortions in Michigan have been nearly cut in half since 1987. Nationally abortions have declined by about a third in that same time-frame. Our country has not been negatively impacted by these individuals. The largest economic concerns facing us today are the result of too few children. An aging population is making entitlements like Social Security and Medicare insolvent. Health insurance rates continue to increase, partly because we have fewer young and healthy people paying premiums into the system to benefit the old and the sick. What about the controversial nature of the abortion issue? A great source of the abortion controversy is because the U.S. Supreme Court and Roe v. Wade leave no outlet for people of conscience to affect change. Less than a third of Americans support the current regime of abortion-on-demand through all nine months of pregnancy, yet Roe v. Wade allows the views of this small minority to override a supermajority of Americans. Abortion will always be a controversial issue until society reaches a broad consensus that unborn children's rights deserve to be protected in law. Even in countries like China—where abortion is totally unrestricted—abortion generates significant controversy. Ultimately controversy is a fact of life in a country with democratic values. If we had feared the controversy of the women's suffrage movement, women would still not have the right to vote. We're still dealing with the controversy of race issues in America today, but keeping slavery legal wouldn't have made the controversy go away. Issues should be decided based on their merits, and voters should make those decisions, not unelected officials. What will happen in the long-term? The prolife movement's long-term goal is to convince a majority of voters and elected officials in all 50 states to respect the rights of every human life. The prolife movement's final goal is a Human Life Amendment to the U.S. Constitution that explicitly protects the inalienable human rights of unborn children. Such an amendment requires a broad consensus in society, which will likely take a long time to build. Prolifers will remain committed to achieving these goals by persuading our fellow citizens, not through heavy-handed judicial decrees. We believe every human being deserves equal protection of their right to life, and that the broad recognition of our equal right to life is the only sound foundation for all of our human rights. We're happy to report that Wexford/Missaukee Right to Life is able to use advertising on Facebook again! Yesterday reporters from Mlive and the Detroit News contacted Facebook about their unexplained ban, and Facebook reversed itself. Mlive ran a story today on the issue. The restoration was very similar to the ban of the Right to Life of Michigan ad account: Facebook told reporters that they contacted us about the mistake, but that never happened. While it's positive that Wexford/Missaukee RTL had their access restored, it's still troubling that Facebook refuses to explain how the mistake occurred, and if they took any steps to remedy the situation for future cases. 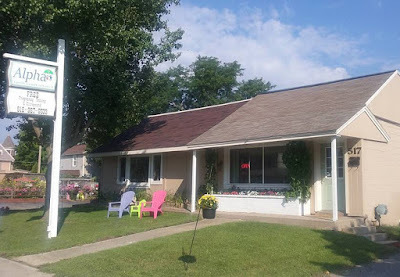 Our best guess is that a disgruntled pro-abortion Facebook user trolled a harmless advertisement of Wexford/Missaukee RTL and reported it as offensive. Facebook automatically banned the page, especially since it's a smaller community group unlikely to have access to media/someone to take their case up to fix the problem. Facebook's customer service responses were all automated form letters responses. When reporters contacted Facebook, that's the point a human being actually reviewed the ban and saw it was indefensible. That's our theory, anyway, in absence of some sort of human contact with a company that prides itself on "community." Nobody should have to rely on reporters to be third-party customer service agents. Facebook needs to resolve this if they want to build "trust" with groups concerned about censorship. Facebook somewhat menacingly told Wexford/Missaukee RTL that there was "no further action you may take" to fix the ban. Well, pardon us, but Facebook doesn't dictate what we may or may not do, and Facebook was wrong here. Imagine walking into a doctor’s office to get your ear looked at because you think you have an ear infection. Upon arriving you notice that the floors are stained and discolored. After waiting for a while staring at these seemingly dirty floors, you walk back into the exam room. After a while the doctor comes in and asks you some basic questions. Then when it comes time to examine you he uses a rusty instrument to look into your ear. As a patient, this would be horrifying. If you were in this sort of situation you would probably walk out and not ever go to that doctor again. It is even harder to imagine a doctor’s office that would be allowed to operate for years in this sort of condition. Now imagine this same sort of place, but you are going there to have surgery. Would you stay? Even after you saw rusty tools and stained floors? Would you be okay having a surgical procedure in a place where you wouldn’t even feel comfortable having someone look in your ears? This scenario is not made up; it is the reality of Whole Woman’s Health, a chain of abortion clinics in Texas. Remember the name? It appears on a Supreme Court decision that was handed down a little over a year ago, Whole Woman’s Health v. Hellerstedt. Many abortion supporter see the case as one of their biggest wins. While they hail it as a victory for women, in reality this ruling showed that the court was willing to cover for abortion-on-demand and ignore the actual safety of women. For years, the self-styled "pro-woman" Whole Woman's Health has prided themselves on fighting the negative stigma around abortion while risking the safety of women. New documents show WWH staff failed to disinfect and sterilize equipment. Their facilities were in disrepair, floors were stained, and the counters were so warped that they could no longer be disinfected. They are not new to breaking rules; for years they have piled up health code violations. Back in 2011 they didn’t have a single registered nurse on site. This is the chain of clinics that five justices on the U.S. Supreme Court decided to give a free pass by declaring "unconstitutional" important health code regulations that apply to numerous other surgical facilities. Time and time again abortion clinics have a double standard and receive free passes when other citizens would find health inspectors coming down on them like a ton of bricks. This is the twisted logic of Roe v. Wade and Doe v. Bolton. There is no reason that clinics like this should be allowed to operate, especially when they have a repeated track record of health violations. It's maddening that places like tanning salons are being held to a higher standard than abortion clinics. If abortion advocates want to claim they fight for woman’s health, then why can't they ever seem to follow basic sanitary guidelines?